Are you one of those people who thinks kale is just for rabbits, vegans, or the super health conscious? I certainly used to be, but lately I’ve warmed to this peppery leaf and its incredible health benefits. And cooking with kale doesn’t mean you’re stuck with plain old kale chips or salads – although those can be pretty tasty. 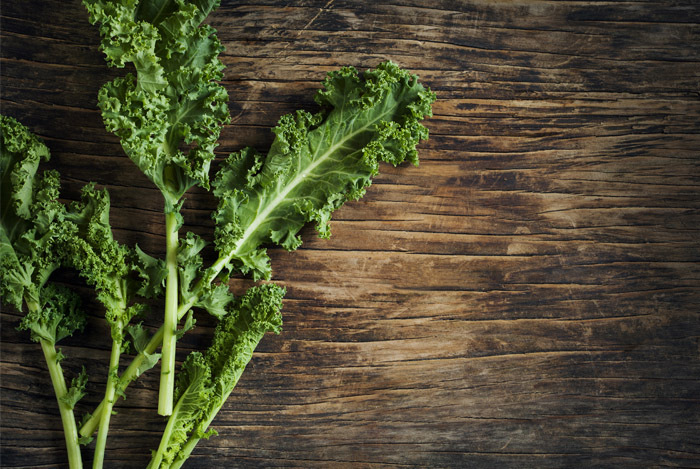 You can have kale with every meal of the day – even dessert! Here are 12 of my favorite kale recipes for breakfast, lunch, dinner and more. Try them out, they might just surprise you. The name of this smoothie immediately caught my eye and after seeing the ingredients I had to give it a go. Who doesn’t want to boost their antioxidant intake? This recipe from The Daily Meal is simple to make and is great for breakfast on the go. I often prep the fruit and kale the night before, meaning all I need to do in the morning is add to the blender and blitz. 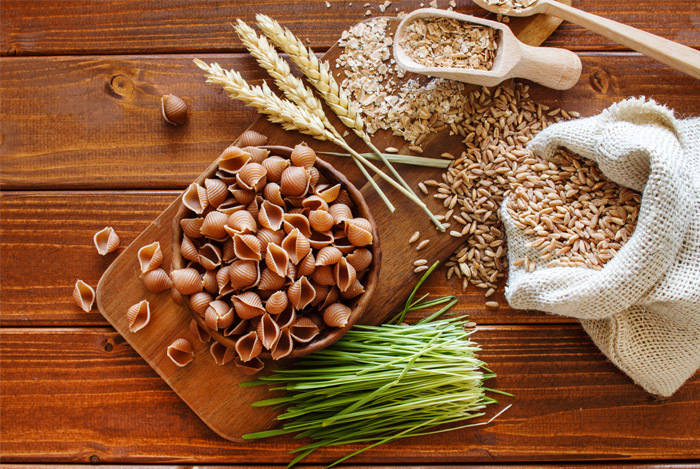 What’s more, flax is a rich source of fiber and omega 3 fatty acids. All in all, these ingredients make for a fairly impressive breakfast drink. Simple – blend and drink. My last breakfast burrito seemed to be a crowd-pleaser, so here’s another recipe from Veggie and the Beast for you guys to try – this time it caters for vegans too. Even though it’s missing the eggs, it’s not lacking in taste! And you’d be surprised that the texture is pretty similar. This kale burrito takes around 25 minutes to make, so it might be best to save for the weekend. In a large skillet, heat the olive oil and add the garlic, onion and half the salt. Cook until the onions are softened. Add the red pepper and tomato, and cook for another 2 minutes, then stir in the kale and cook until softened. Crumble the tofu on top of the veggies, and add all the spices, nutritional yeast and remaining salt. Cook over medium heat for 7-10 minutes, stirring frequently, until the tofu has absorbed the liquid from the tomatoes. 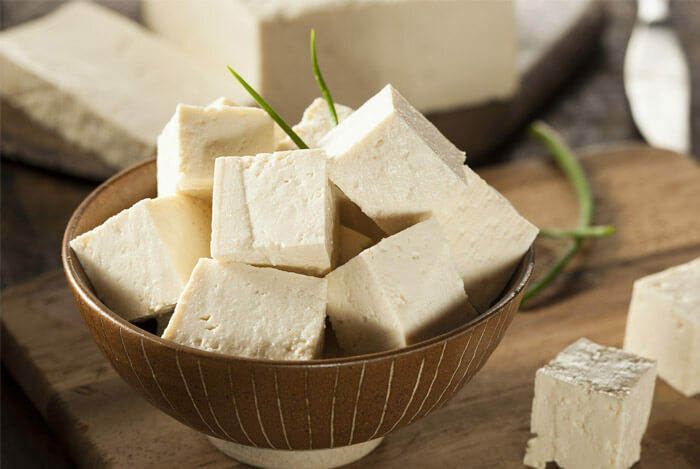 Don’t let the tofu get crispy – it should be egg-like! Spread each tortilla with a quarter of the avocado, top with some tofu mixture, a drizzle of hot sauce and roll up tight. While most omelette recipes call for spinach, I think kale works even better. I’ve been hooked on kale omelettes since subbing kale for the spinach in this recipe from New York Times Cooking. Combine these two foods with kale and you have a winning start to the day. To top it all off, this recipe is gluten free. Wash the kale leaves (don’t dry) and soften in a frying pan over medium-high heat, adding a little water if needed. Drain, cool, chop and then toss with half the garlic, salt and pepper. Beat the eggs in a bowl and add remaining garlic, milk, salt and pepper. Heat an omelette pan over medium-high heat and add the oil. Pour in the egg mixture, and shake the pan gently. Lift up the sides, allowing the eggs run underneath. 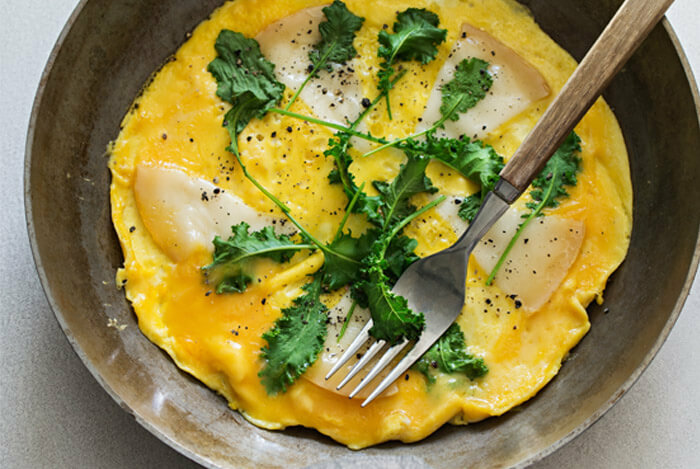 Once the eggs are set on the bottom, sprinkle the kale over the middle of the egg pancake and top with the Parmesan (if using), and fold the omelette over on itself. Cook to your liking and enjoy! Another favorite meal of mine, here are my go-to kale based recipes to keep me going right into the evening. Angela Liddon at Oh She Glows is a big proponent of whole foods cooking – she’s also the creator of this flavor packed healthy kale salad. 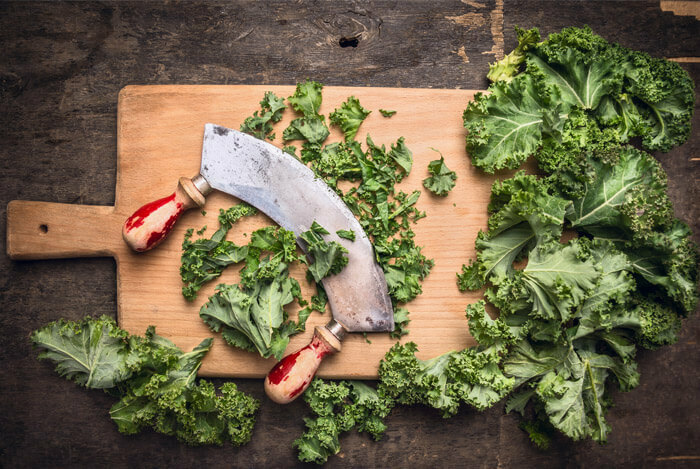 The lemon juice adds zing to the peppery kale (along with a ton of health benefits) and the cranberries sweeten it up. Instead of using traditional Parmesan cheese (which is high in protein and calcium but also sodium) Angela uses a version made from pecan nuts. Preheat oven to 300F and toast the pecans for 8 to 10 minutes. Meanwhile make the dressing. Add garlic, lemon juice, oil, salt and pepper in a mini food processor and combine. Place kale into a large bowl and add the dressing, working it into the kale with your hands (I prefer to toss with spoons). Blitz the pecans, nutritional yeast, oil, and salt until it’s a coarse, crumb-like texture. Sprinkle the pecan Parmesan and cranberries over the salad. Let sit for up to an hour before eating. The great think about soup is that it’s so simple, yet fuels me right through the day. Alexis aka Hummusapien created this veggie packed lunch recipe for those winter days when you just find it hard to swallow down an ice cold smoothie, or get excited about a salad. 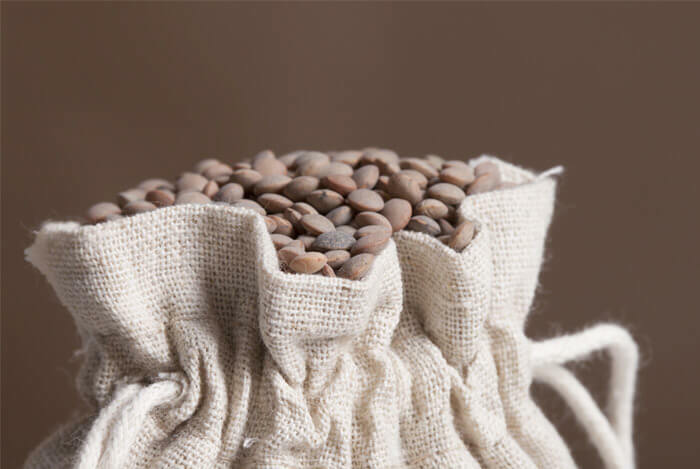 The brown lentils are one of my favorite protein packed foods, and are the secret behind this soup’s satiating powers. Carrots are a rich source of beta-carotene – one of the ways our body gets vitamin A, which is vital for good eyesight. You know what else has vitamin A? Kale. This soup might just help you see in the dark! Heat your oil in a heavy-bottomed pot over medium heat. Add onion, celery and carrots and sauté until softened. Add lentils, broth, water, salt, garlic, cumin and coriander. Stir together and bring to a boil, then reduce heat to low and simmer, covered, for 20 minutes. Then add chopped potatoes and simmer until tender. Finally, add the kale and simmer until wilted. Remove from the heat and stir in red wine vinegar. Season to taste with salt and pepper. This recipe from Mind Body Green is an ideal lunch to bring to the office, and the whole wheat wrap is a valuable source of complex carbohydrates. The fiber will keep your blood sugar levels stable and help you stay full. And with the feta cheese, heart-healthy oils, hummus and avocado, this wrap would work well for those following a Mediterranean diet. In a bowl combine the kale, olive oil, lime juice and salt. Massage the dressing into kale until it feels soft. Assemble the wrap by adding the hummus, avocado, feta cheese and finally the kale mixture. Wrap up tightly. Work was hard, you’re exhausted and it seems easier to reach for the take-out menu than cook up a storm. I know the feeling. But wait – this recipe from Cookie and Kate will be cooked in mere minutes, faster than your pizza delivery will arrive. Add this omega-3 rich kale pesto to gluten free or whole wheat pasta for a quick and satisfying evening meal. Good fats, complex carbs, and protein will help lift your flagging energy levels too. Add all the ingredients and process (told you it was super-fast). Cook your pasta according to package instructions, drain and add in pesto as required. The extra pesto will keep in the fridge for a few days and can be used in sandwiches, wraps, salads and on healthy homemade pizzas. You might know by now that I’m a big fan of salmon – it’s a seriously nutritious food, full of protein and omega-3 fatty acids. This incredibly flavorsome dish comes from Ashley Couse at Goop. The coconut flakes and coconut milk complement the kale perfectly and also add more healthy fat. The rice gives a great energy boost. Okay, this meal may be a little on the high-fat side but it’s otherwise healthy and ideal for the weekend or a special occasion. Rinse rice and add to a saucepan with coconut milk, water, and salt. Bring to a boil and stir. Reduce to the lowest heat, cover, and cook for 15 minutes. Once cooked, remove and let stand for 10 minutes. Meanwhile, heat oven to 400F. In a lidded jar, add melted coconut oil, sesame oil, coconut aminos and sriracha and shake until emulsified. Place the kale and coconut flakes on baking sheet. Drizzle with about two thirds of the dressing and toss until well-coated. Drizzle the salmon with 1 to 2 tbsp of the remaining dressing. Bake the salmon and coconut kale mixture until cooked through, being careful not to let the kale burn. Remove from oven and serve over fluffed rice with an extra drizzle of dressing. This meal from Food Network is pretty simple, but I think simple can often be the best, don’t you? 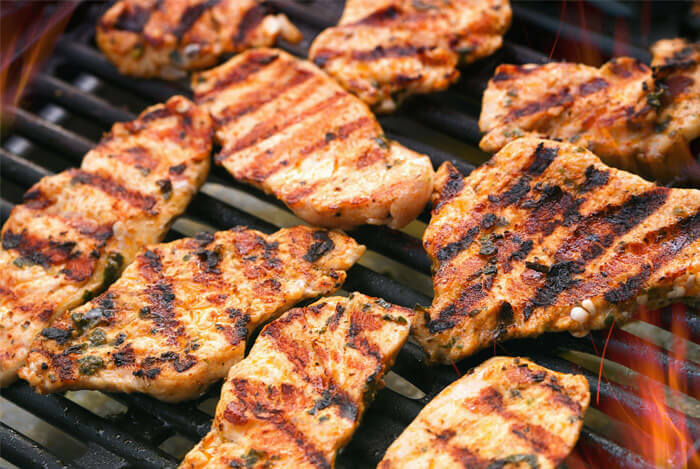 Grilled chicken is a great source of lean protein, and it pairs so well with the unique taste of kale and lemon juice. Potatoes add carbs for energy and the optional Parmesan cheese adds calcium. Preheat the oven to 425F. Toss the potatoes with 1/2 tbsp olive oil and roast for 5 minutes. Toss the kale in a large bowl with the garlic, 1/2 tbsp olive oil, salt and pepper. Add to the baking sheet with the potatoes and toss. Roast until the kale is crisp and the potatoes are tender (15 to 20 minutes). Slice the chicken breasts in half. Coat evenly with 1/2 tbsp olive oil and season. Grill until cooked through. Toss the kale, potatoes, the remaining olive oil, salad greens, tomatoes, Parmesan, lemon juice, and salt and pepper to taste in a large bowl. Divide the chicken among plates and top with any collected juices. 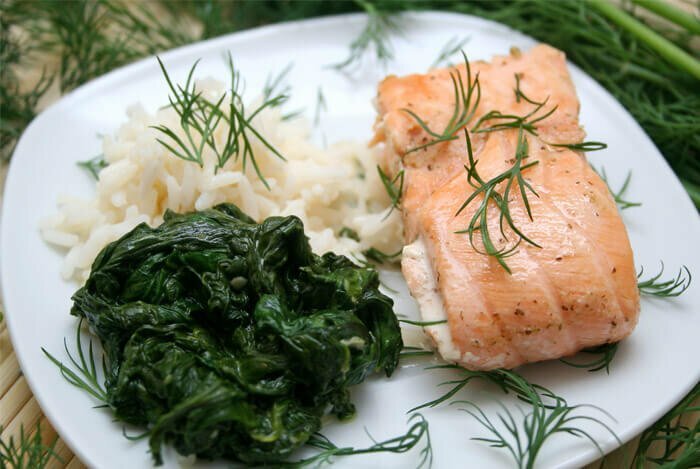 Serve with the kale salad. I just had to include a kale dessert recipe to show how versatile this superfood really is. And to prove that desserts can be healthy! I’ve also come across kale chocolate brownies and a bright green kale and apple cake…but they’re a little too extreme for me. This recipe from ‘Kale: The Complete Guide to the World’s Most Powerful Superfood’ and featured on Oh My Veggies is perfect though – summer fruits and kale make a great refreshing pop. 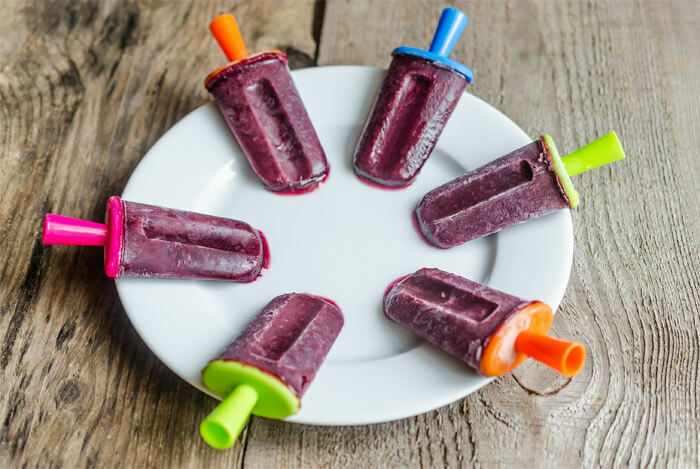 Instead of sugar, these pops are sweetened with organic purple grape juice and frozen blueberries so you can enjoy them guilt free. 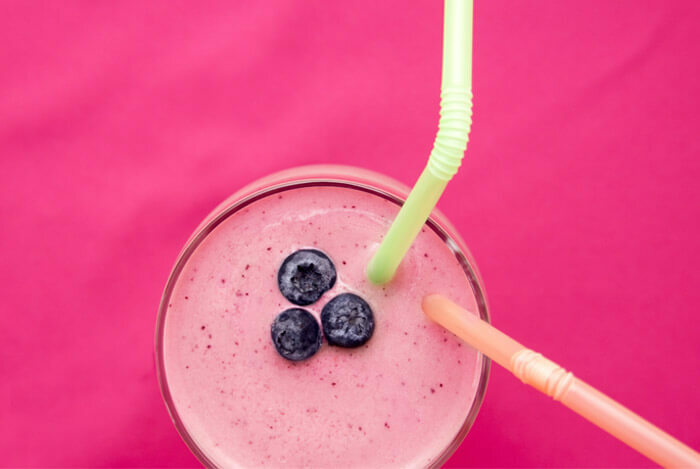 In a food processor or high-powered blender, blend all ingredients until liquefied. Pour into ice pops molds and freeze until solid. No list of kale recipes would be complete without kale chips. While they certainly don’t taste exactly like regular store bought chips, they’re tasty in their own right, and much, much healthier. 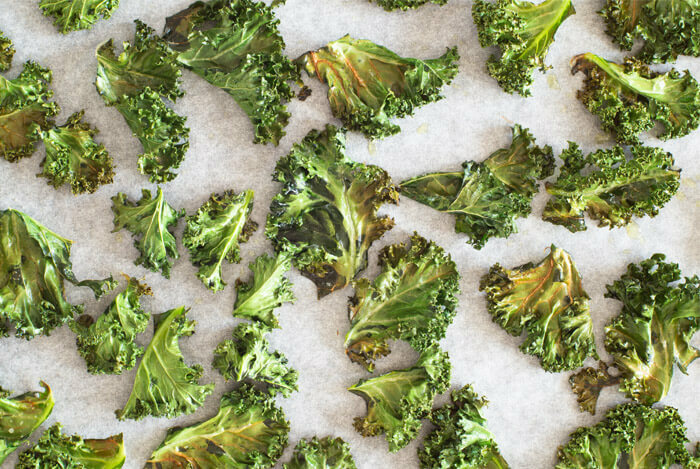 Angela at Oh She Glows probably offers the best tips for making flawless kale chips but the recipe is so easy that anyone can do it. Preheat oven to 300F and line a sheet with parchment paper. In a bowl add the kale, olive oil and optional toppings. Toss well to combine. Spread kale on the sheet and bake, turning halfway, until the kale is crispy but not burnt (usually around 25 minutes). These chips don’t stay crispy for long, so enjoy immediately. Now, I hope you see that kale is not just an amazing superfood but is incredibly versatile and works for any meal. What’s your take on delicious kale recipes? Have anything else you’d like to share? Let me know in the comments below!